Full Professor Suzanne Rivard (Information Technologies) has been awarded an honorary PhD from Aix-Marseille University in recognition of her work and her contribution to science. Aix-Marseille University is the world’s largest French-language university in terms of its budget and student enrolment. Professor Rivard served as a guest professor there in 2015, with the Centre d'Études et de Recherche en Gestion d'Aix-Marseille (CERGAM). “If one measures a person’s qualities by their long-term impact, then Professor Rivard has a great many qualities. Her sage advice still informs many of our department’s policies today,” noted Professor Serge Amabile, co-head of the CERGAM. 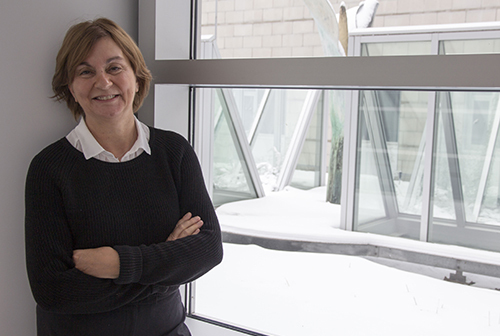 Professor Rivard holds the Chair in Strategic Management of Information Technology at HEC Montréal and is a member of the Royal Society of Canada and a Fellow of the Association for Information Systems (AIS). She is also a member of the Research Group on Information Systems (GReSI), a Fellow of the Centre for Interuniversity Research and Analysis on Organizations (CIRANO) and a past Senior Editor with the Theory and Review Department of MIS Quarterly. A pioneer in many areas and an avant-garde researcher, Professor Rivard is highly influential in her field, in particular risk management for IT projects, contracting out, business process transformation, and IT implementation and strategic management. She has supervised 14 PhD dissertations and over 50 master’s theses. 2015: Named a Fellow of the Association for Information Systems (AIS), one of the highest distinctions in the information technology (IT) field. 2014: Appointed Associate Editor of the Journal of Strategic Information Systems. 2012: Won the Best Paper award for a paper published in 2012 in the Journal of Strategic Information Systems, for “A Multi-Level Investigation of Information Technology Outsourcing,” co-authored with Benoit Aubert, Jean-François Houde and Michel Patry. 2010: Appointed Senior Editor (Theory and Review) of MIS Quarterly. 2009: Won the Marcel Vincent (Social Science) award from the Association francophone pour le savoir (Acfas), for her outstanding contribution to advancing knowledge in her field. 2007: Won the Gérard Parizeau award, along with a cash prize of $30,000, in recognition of the value and originality of her thinking and her research. Appointed Associate Editor of the Journal of Management Information Systems, Senior Editor of the Journal of the Association for Information Systems, and a member of the Advisory Committee of the MIS Quarterly Theory and Review Department. 2006: Won the Best Paper award for a paper published in 2005 in MIS Quarterly, for “A Multilevel Model of Resistance to Information Technology Implementation,” co-authored with Liette Lapointe, of McGill University. 2005: Inducted as a Fellow of the Royal Society of Canada. 1999: Won the Pierre Laurin award for research, from HEC Montréal. 1994: MIS Quarterly adopted the keyword classification scheme for the IT field that she developed with Professors Henri Barki and Jean Talbot, which has become the standard reference in the field.